Italy boasts of some of the world’s most admired coastlines due to the distinct synergy of old colorful coastal villages surrounded by steep green hills and cliffs carved by the mild thunder of the Mediterranean. Cinque Terre in the Northern Liguria region is one of the best known areas to see this splendor. Literally meaning “Five Lands”, this UNESCO heritage site is composed of five small towns – Monterosso Al Mare, Vernazza, Corniglia, Manarola, and Riomaggiore. The colourful villages scream touristic rustic feels with old houses painted with bright washed-out hues. With the lush green trees and the blue horizon in the backdrop, the villages are best viewed from the steep hiking tracks that interconnect them. Automobiles are not allowed to penetrate most parts of the town for obvious reasons (narrow steep roads) so the towns can be best accessed by rail or, when you are fancy enough, by ferries. 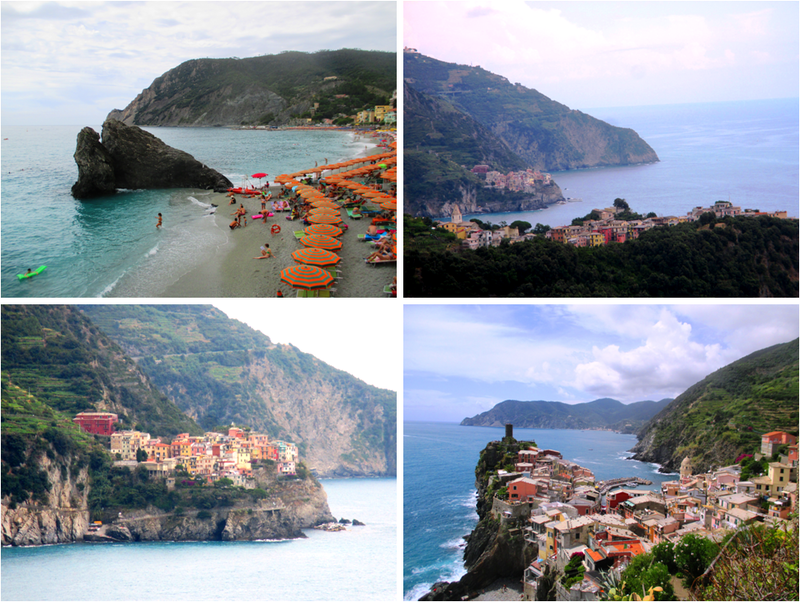 Clockwise from Top Left: Colorful umbrellas lining the coast of one of Monterosso’s beaches, Bird’s eye view of Corniglia from the hiking trails, Manarola on a cliff seen from afar, and the progressing view of Vernazza’s houses. Sandy beaches are of course, sputtered along the coast although a throng of tourists may annoy you at times especially during summer. Seafood is of course a thing, with the anchovies of Monterosso as this region’s pride. The view of Vernazza from the hiking trails I think was the best since the town has a unique skyline dominated by the Doria look-out tower and the Church of Santa Margherita d’Antiochia’s octagonal bell tower, perfectly laid out against the rough cliffs. Definitely a romantic getaway, Cinque Terre offers a warm colourful escape from the auburn, packed, and crowded ancient cities of Italy with the former’s blend of nature and old village ambience facing the always refreshing ocean breeze.